Who could have foretold the destiny of André Navarra when he was born into a modest family in Toulouse on 11 November 1911? His father was a porter at the early morning market, and in the afternoon played the double bass at a café called Les Américains. 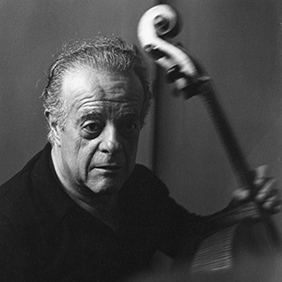 His uncle Michel might have been almost clairvoyant when he chose the boy’s seventh birthday gift: a ¾ cello. The introverted child spontaneously transferred his fervour to the instrument. It was a passion that accompanied him ceaselessly until he died, surrounded by his students, in Sienna on 31 July 1988. Awarded the first prize at the Conservatoire de Paris by unanimous decision of the jury when he was only 13, he set out living the austere life of an athlete (he was an expert boxer), refusing to be distracted from his instrument and renting a studio above a garage to practise all night without disturbing the neighbours. He was barely 20 years old when his soloist career began, taking him across Europe as he performed with the finest orchestras to play all the concertos of the repertoire. Navarra took first prize at the Vienna International Competition in 1937. But the war put a temporary obstacle in the way of his ascension. Unlike some of his fellow musicians, he refused to collaborate with the occupiers and he took refuge behind his music stand, playing as an ordinary member of the Paris Opera orchestra. From 1945 onwards, he could again be heard in the capitals of Europe, conducted by the likes of Munch, Paray and Barbirolli, and later Mehta, Ristenpart and Ančerl. A parallel career opened up for him: teaching. He taught in Paris, Sienna, Saint-Jean-de-Luz, Nice, London, Vienna, Sion and Detmold. His mastery of the bow was unique: he borrowed the technique used by violinists. It revolutionized the method of cello playing, bringing roundedness, sensitivity and strength. He pursued his two callings with equal intensity, one career enriching the other, as this collection shows so clearly. He approached every repertory with the same passion: contemporaries such as Jolivet and Schmitt; classics such as Bach, Boccherini and Haydn; romantics such as Dvořák, Brahms, Schumann, Bruch and Bloch; and early 20th century composers such as Prokofiev, Kodaly and Martinů.